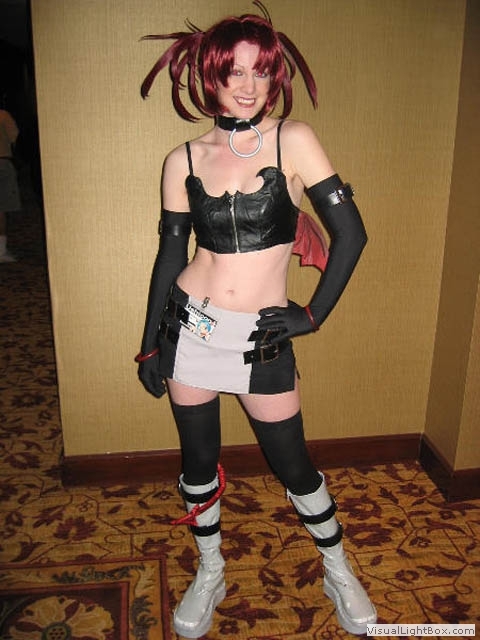 I really wanted to make a fantastic costume for UshiCon 2005, my first convention, so I went with Etna because she's such a great character. I think the hardest parts of this costume were the boots, wig, and all of the lovely hand sewing I had to accomplish on the costume. The boots were originally black leather spray-painted grey...but it took only a few hours of walking around to make all the paint flake off (I wish I had known that would happen! ), so I bought some Ugg-type boots and souped them up in one night. The wig is actually 2 wigs: separate pig-tails super-glued and sewed into the wig base. And "got2b glued" is the best product out there for wig hair! The top I bought from a biker leather store and then I hand tailored it - yes, I hand sewed the leather; my hands hurt for hours after every sewing session. I already owned the skort, so I just had to sew the grey panel onto the front. I bought $75 worth of belts from Goodwill and painted all of them black. The belt buckles were hand-sewn onto the belts in order to match the different belts that Etna has - two arm, four skirt, and four boot. I used some left over leather to make the collar, with Velcro's in the back, and the ring is a plastic bangle painted silver. The wings belonged to an 18" Halloween bat purchased at a party store and were subsequently cut off and mounted on Velcro so I could attach them to the back of my top. The bracelets, tail, and wings were spray painted red then black for a deep red color effect. I found the tail and opera gloves at a great costume store in Austin. The skull earrings were made from skull beads that I acquired from Ebay, which were glued onto earring posts. The thigh high stockings were purchased at a party store. I did eventually buy some red contacts to wear along with the costume, but since I wear prescription lenses, I could only wear them for a few hours at a time. I tell you what, for my first cosplay costume ever, I think I did pretty well. 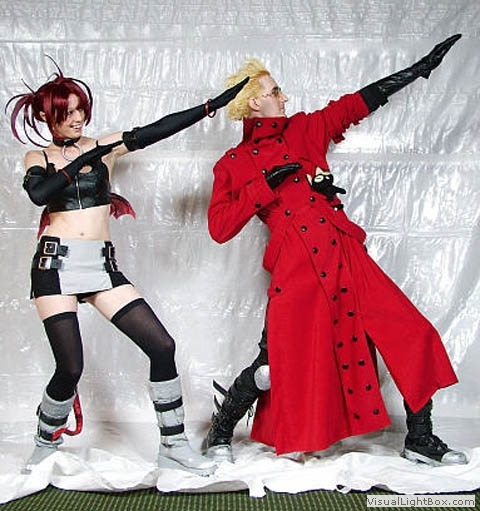 Everyone at UshiCon really loved it and I had a lot of fun getting glomped and photographed. 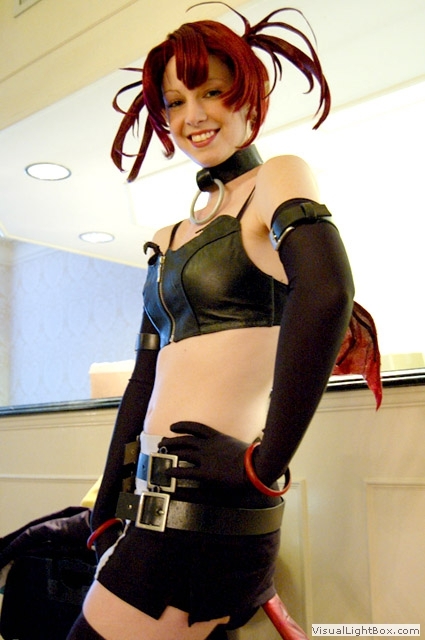 I'm really glad I chose Etna for my first cosplay, and I will always have great memories of her.